Our on-site x-ray equipment provides high quality radiographs to aid in the quick diagnosis of many disorders. They help our veterinarians evaluate musculoskeletal, cardiovascular (cardiopulmonary), gastrointestinal, reproductive, and urinary systems. 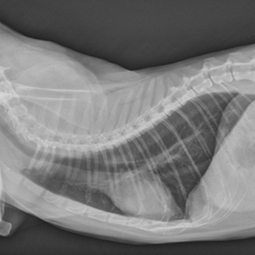 In the case of referral to a specialty practice, we are able to email radiographs to ensure faster diagnosis. We also have the capability to create a portable version of films by loading them onto a disk or external drive that a client can take with them. These images are also loaded into each patient's electronic chart. This allows for quicker recall of images for future use as well as the ability to electronically measure and notate directly on the images.